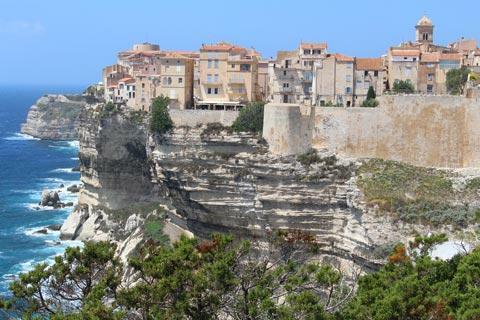 Bonifacio is a lovely medieval town and the oldest town in Corsica, having been founded around 830. 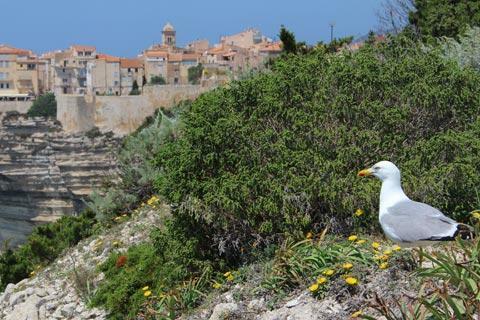 It is situated on the cliffs of a limestone peninsula above a natural harbour on the site of a 9th century citadel and the combination of resort, medieval town, scenery and nearby beaches make it one of the unmissable highlights of your trip to Corsica. Your visit to Bonifacio falls in two distinct parts - taking a promenade around the the harbour and sea front area, and exploring the historic old town with the citadel. 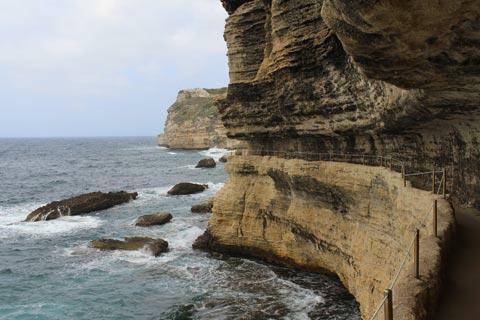 You will also want to follow the footpath along the cliffs to the east for great views across Bonifacio and the coast, and to descend King Aragon's staircase, and perhaps take one of the boat trips and enjoy lunch in one of the many cafes, so allow at least a day to explore. Park in one of the car parks behind the harbour. Unfortunately parking in Bonifacio is very expensive and unavoidable. Expect to pay 20 euros a day! 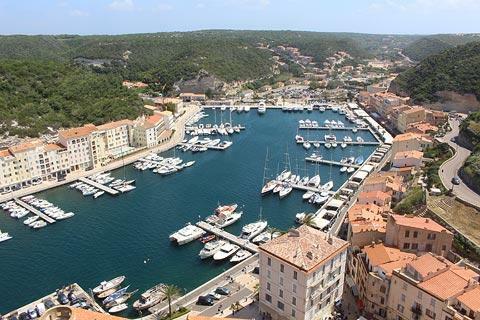 There are actually three port areas in Bonifacio - the fishing port, the pleasure port, and the port where boats depart for trips along the coast, to the Lavezzi Islands and across to Sardinia. Overall the port is the busiest Mediterranean port in France. The main part to explore is the harbour area around the pleasure port, which is very elegant with palm trees and numerous bars, shops and restaurants lining the quay, and a chance to admire the luxurious boats that are moored here. 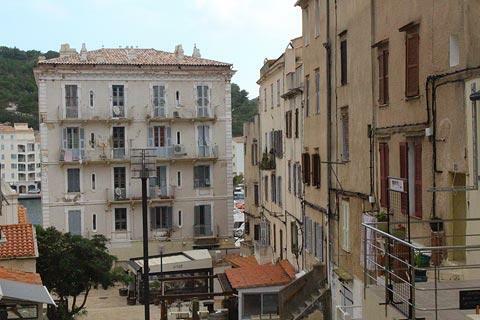 Some of the buildings on the west side are rather new looking so lack the charm, for example, of Bastia harbour but not enough to spoil your visit! 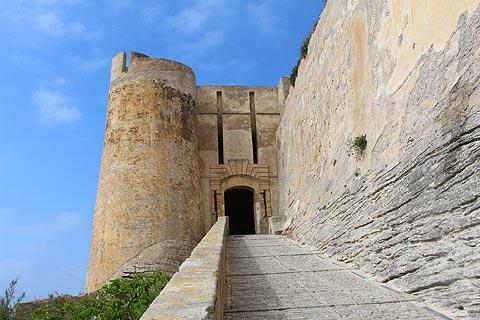 After taking a walk around the harbour you can walk up the long staircase that leads to the citadel. 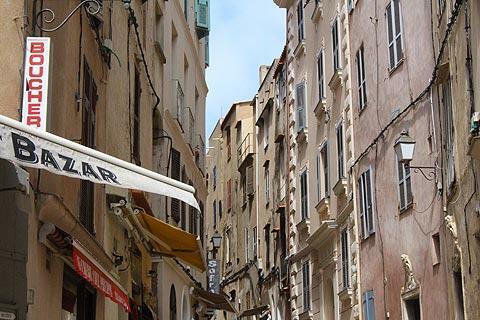 Set about 70 metres high on the cliffs above the harbour, Bonifacio old town is a maze of narrow cobbled streets and medieval buildings, picturesque squares and small cafes. 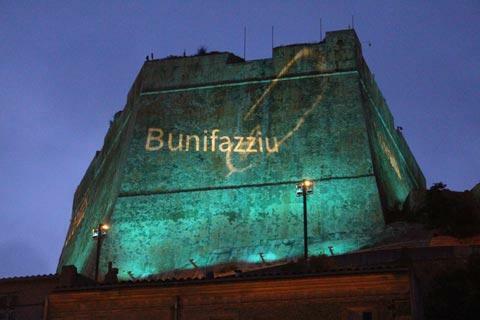 You enter through the imposing gateway through the walls of the citadel at the top of the path from the harbour. It is easy to explore the citadel - being on a narrow peninsula it is not easy to get lost! 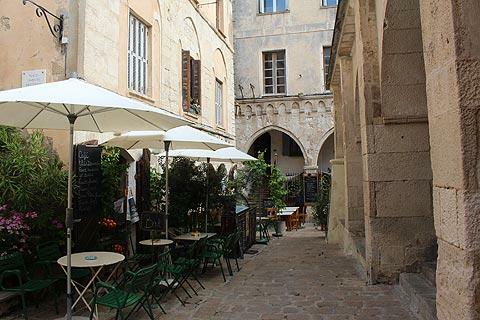 The centre of the town is based around the Place d'Armes and the Place du Vieux Marché, and the surrounding streets. Important religious monuments in this part of Bonifacio include the 13th century Church of Saint-Dominique and the 12th century Church of Sainte-Marie-Majeure (the oldest building in Bonifacio). 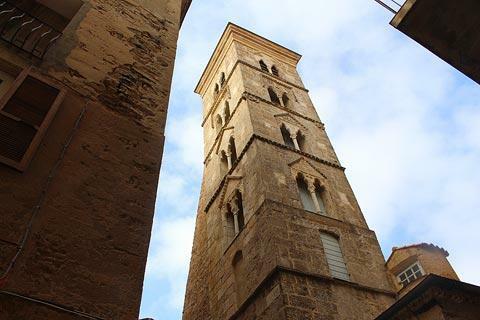 These important monuments are certainly worth visiting although the real highlight is the town itself, with lots of small architectural details adding to the charm. 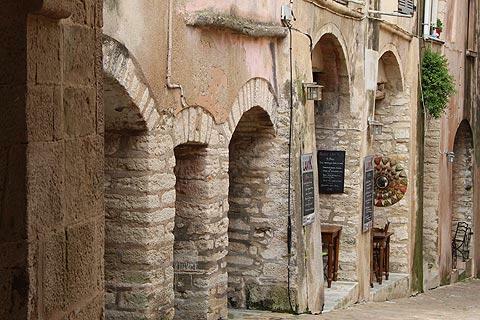 The stone 'arches' across the narrow streets that you will often see overhead between the buildings were originally used to distribute water around the town. 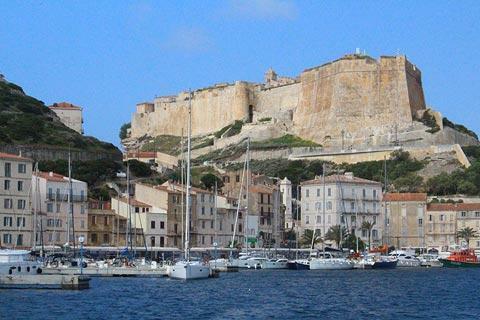 As you continue through the citadel you will reach the substantial fortified building that dominates the eastern part of the town, the 16th century Etendard Fort and garden. It costs 2.50 to enter and you get lovely views across the harbour and see some excavated ruins. 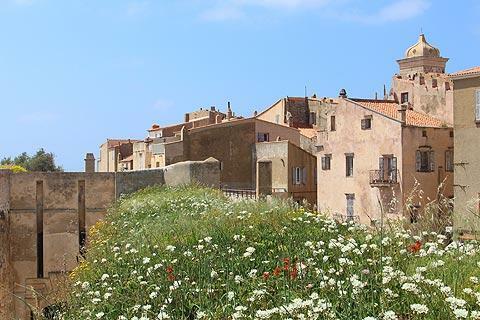 The bastion is also advertised as having terraced gardens - which is why we paid to enter - but they were abandoned and full of weeds when we visited (in May) which was disappointing, especially when there are so many lovely plants elsewhere in Corsica that you can see without paying! There is a small entrance charge payable but a visit is highly recommended. Note that some visitors have vertigo when descending the staircase and most visitors (myself included) have tired legs when climbing back up 187 uneven steps (30-40 cm tall), but there is no option: if you walk down you walk back up again! 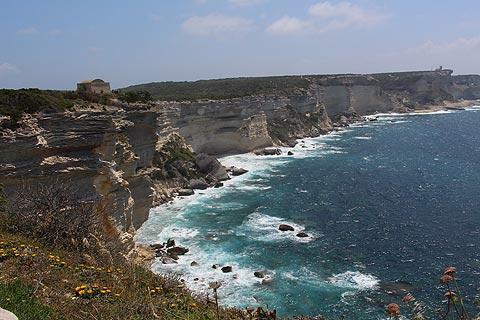 There is also a newer construction called the Gouvernail to the west of Bonifacio, constructed during the Second World War and leading to a large rock platform with beautiful views to Sardinia and across Bonifacio harbour. 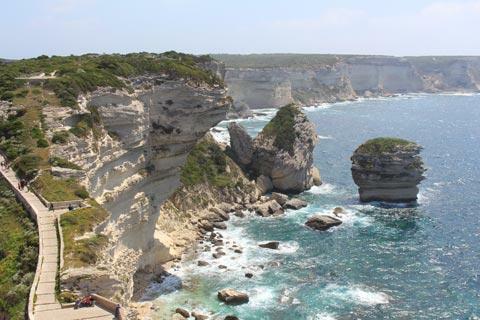 Le Gouvernail itself is in concrete and in poor condition and rather spoils this end of Bonifacio. 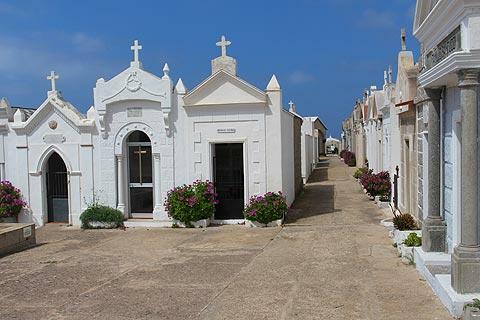 You should also visit the cemetery at this end of Bonifacio. 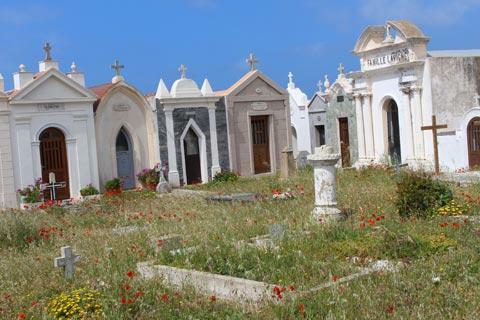 Claimed to be one of the most beautiful cemeteries in France, it is most unusual with the many small chapels laid out in streets with garden areas, so its rather like a small and abandoned town! Sunset is the ideal time to come here if possible, perhaps before taking another stroll around the old town, which has a different character after dark, or enjoying one of the musical events that take place quite regularly. 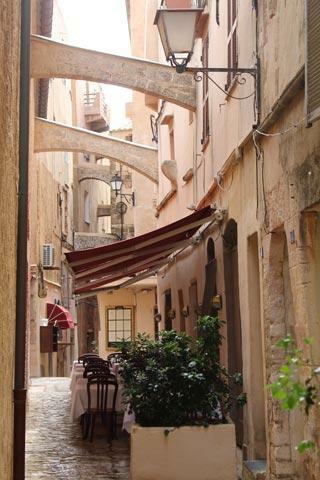 You will also find a good number of restaurants in Bonifacio old town so it is easy to find somewhere to escape from the heat in the middle of the day - although they are sometimes rather expensive and 'touristy'. After leaving the citadel you should follow the path along the cliffs to the east. The return walk takes about 20 minutes and is one of the highlights of a visit, with exceptional views along the cliffs and to the town. 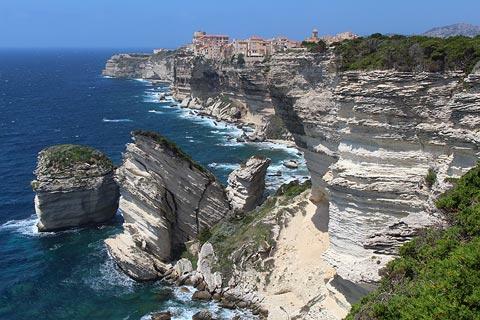 France This Way comment: if you have limited time to explore Bonifacio, we would give this walk priority over a visit to the Gouvernail or to the Staircase of the King of Aragon. The coast around the town is very picturesque, with several renowned Mediterranean beaches nearby and separated by cliffs, caves and dramatic coastal scenery, including the calanches of Fazzio, a protected site. 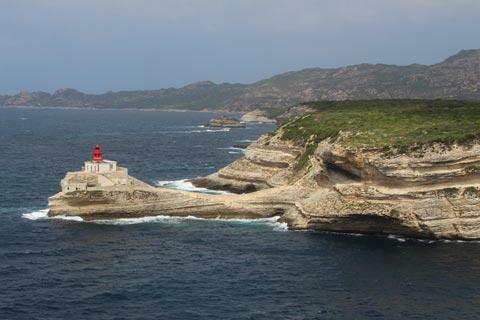 The Lavezzi Islands, a designated marine preserve, are just off the coast from Bonifacio and can also be visited by boat from here. These islands have no facilities (so bring food and plenty of water and suncream!) 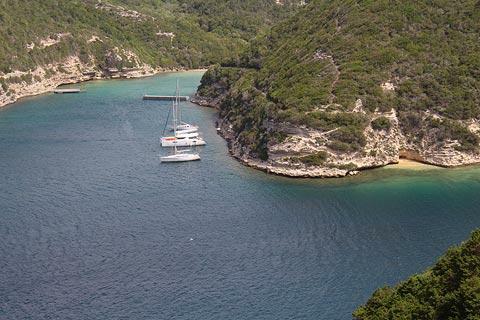 but are a lovely place for a walk, to pass some time on the beach, or for snorkelling.